Old Zooniverse hands know all about serendipity – Hanny’s Voorwerp was an unplanned and unexpected discovery from Galaxy Zoo, and has generated a great deal of new science. It could be that involving lots of people in the process of science (the citizen science approach) is a particularly good way to generate surprising and unexpected discoveries. 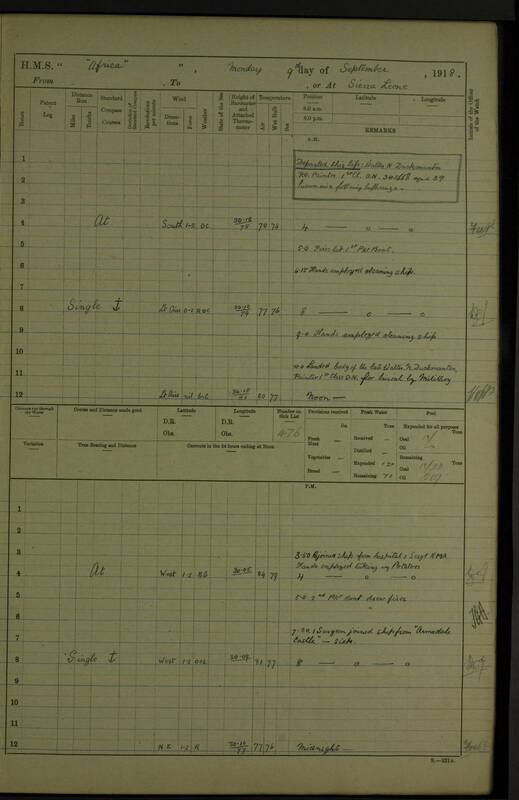 When OldWeather started, the science team were clear about what we wanted – weather observations please, and lots of them – but we were also aware that there was a lot of other material in the logbooks, and that we needed to enable those reading the logs to record whatever they thought was important. I only really do weather, but I’m not immune from the general fascination that the logs exert over those of us who use them, so I’m very curious about what will emerge from our collective studies – what will the citizen scientists decide is worth recording? I haven’t yet seen anything as dramatic as a Voorwerp, but quite a few people are getting interested in the sickness records in the logs, and their relationship to the well-known ‘spanish flu’ outbreak in 1918. Many of the logs contain a record of the ‘Number on Sick List’; we didn’t ask for this number to be recorded, but some people have decided to record it anyway, and so far the database has accumulated values from almost 10,000 log pages from 126 different ships. I don’t have any professional expertise in medicine or epidemiology, but I couldn’t resist the temptation to have a peek at the data, and see what had been found. Number of people on the sick list - all ships. 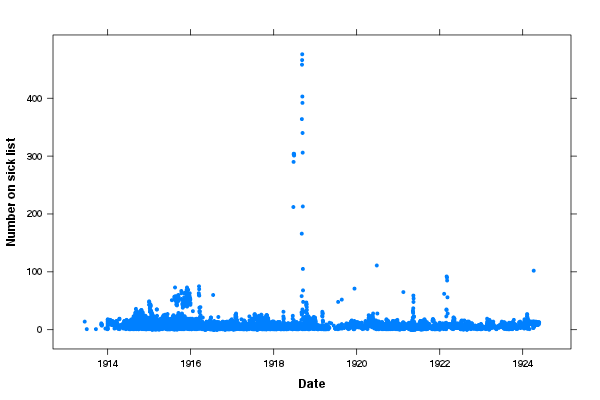 The figure above shows all 10,000 values, arranged by date. We need to be careful when looking at the data, because I haven’t been able to quality control the sickness counts the way we do with the weather observations, so certainly a few of these points will be errors; but we can see a basic pattern. There are generally only a few people off sick, but occasionally there is a short-lived spike in the number – sometimes to hundreds on the list at once. On September 2nd 1918 the Spanish flu caught up with HMS Africa, and the cases mounted fast – reaching a peak with 476 people ill on the 9th. The Africa was a big ship, a King Edward VII-class battleship, but even so 476 people is nearly 2/3 of the crew; and it must have been a major challenge keeping her operational. The logbook, however, gives few hints of the struggle; and certainly they managed to continue their weather observations through the outbreak – the Navy’s dedication to duty is justly famous. Though virulent, the outbreak was brief; By September 21st the Africa had overcome the virus, but the victory was not without cost – log pages over the infection period regularly record deaths from influenza. So congratulations to all those who’ve been recording sick-list counts – there’s definitely some interesting material there, and it’s great to see the collective intelligence of the project generating new research directions. I can’t say whether the sick-list counts will lead to new published science in the end – I’m only a climatologist – but I look forward to finding out. In a nutshell, the forum doesn’t work for me. At all. At first I tried logging in with my existing zooniverse account, but when I kept getting a message that I had entered a wrong password, even though I hadn’t, I thought that maybe I had to register for a separate forum account. For some reason, though, this didn’t work either (the link takes me back to my zooniverse account settings, which suggests that normally I *should* be able to log in with that account, but I’m not). If I reset the password, the process seems to complete OK, but then when I try to log in there’s a message saying “Password security has recently been upgraded. Please enter your password again.” Of course I can retry as many times as I want, it doesn’t go through. Something is seriously broken for a small group of people. Help.